One of the books I finished reading on our transatlantic crossing was The Muralist by B.A. Shapiro. I grabbed it from a list of suggested readings from the library and was pleasantly surprised to find an excellent read. Danielle Abrams working at Christie's auction house in the art department discovers what she believes to be pieces of her great aunt's work from the late 1930s. The aunt, Alizee Benoit, mysteriously disappeared in 1940. The book goes back and forth between the present and the past creating the mystery by detailing the life of Benoit as she worked as a muralist for the government works project during the Great Depression. A Jew with family in France that she discovers have become victims of the Nazi invasion. While the reader agonizes with Alizee over her struggle to get her relatives visas to come to the USA, you also see the struggle of Danielle to solve the mystery of what happened to her aunt and get her work recognized. I loved the insight into the work of those making murals for government buildings as well as seeing the evolution of the modern art movement in the States. 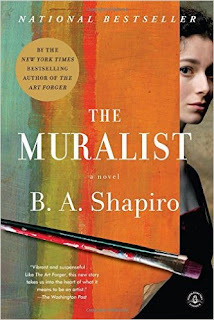 While there are real life characters in the novel such as Eleanor Roosevelt and Jackson Pollock the author, Shapiro, has done a great job of integrating the fictional characters into the historical background and weaving all the characters together. Definitely consider this a great book for the road.